Covers key federal standards preventing marketplace deception and federal and parallel state remedies for violations. Special chapter on the TCPA. Robocalls compromise privacy and public safety, undermine the federal Lifeline telecommunications program by using up low-income consumers’ limited minutes, and subject vulnerable consumers to harassing and intrusive telemarketing and debt collection tactics. NCLC works to defend and strengthen consumer laws, particularly the federal Telephone Consumer Protection Act (TCPA), to protect consumers from abusive and illegal practices. Take Action: Tell the FCC and Congress to keep strong rules in place to stop these unwanted robocalls to cell phones. The problem is worse than it seems. Hover over your state on the map below to see just how many robocalls were made to your friends and neighbors last year (total appears below the map). Many of these calls were made illegally, to cell phones without consent. The Federal Communications Commission has taken aim at scam and spoofed (disguised number) calls but receives frequent requests for exemptions from consumer protection laws from some of the largest banks, telemarketers, and debt collectors. 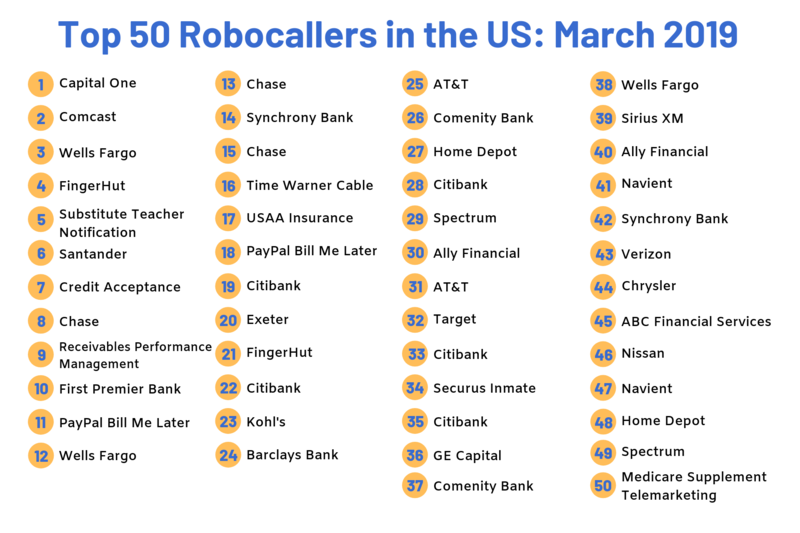 Data shows that large banks and credit card companies consistently rank among the top sources of robocalls. Legitimate businesses making illegal calls to cell phones without consent has led to 2018 being the worst year on record for robocalls. Take Action! Have you or a loved one been harassed by a bank or debt collector with robocalls to your cell phone? Help #EndRobocalls. Tell the FCC and Congress to keep strong rules in place to stop these unwanted robocalls to cell phones. 5/24/18 BYU Radio “Robocalls on the Rise“ NCLC Senior Counsel Margot Saunders joins Julie Rose for her “Top of Mind” broadcast to discuss the rising toll robocalls take on consumer privacy and what can be done to stop them. 5/18/18 Vice: Motherboard “Our Robocall Hell Is a Result of Inconsistent Enforcement and Carrier Apathy” quotes NCLC Senior Counsel Margot Saunders discusses the failure of telephone service providers and regulators to do enough to stop robocalls. 1/17/18 NBC News “It’s not just you–Americans received 30 billion robocalls last year” quotes NCLC Senior Counsel Margot Saunders on the volume of robocalls and company’s efforts to amend the rules to make even more robocalls. 11/20/17 WIRED “The Robocall Nightmare Is Only Getting Worse–But Help Is Here” quotes NCLC Senior Counsel Margot Saunders on the prevalence of unwanted robocalls from banks and debt collectors while the FCC remains focused on scam calls. 6/26/17 The Hill “Consumers Need Strong Protections from Robocalls” by NCLC Senior Counsel Margot Saunders.